Let us paddle along the spectacular Naerøyfjord while admiring picture-perfect landscapes and enjoy a lovely picnic lunch surrounded by the wild beauty of nature. 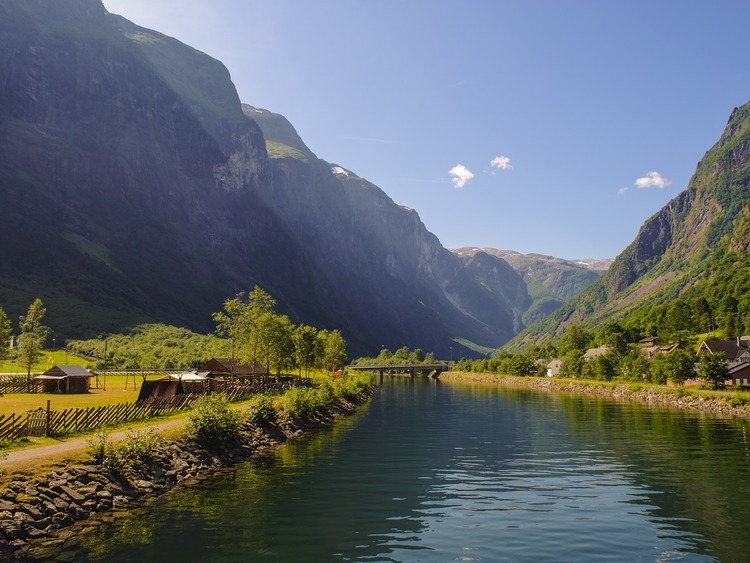 * We leave the small port of Flåm behind us to reach the Viking village of **Gudvangen**, nestled in the Naerøyfjord and surrounded by a fairy-tale landscape. * This is where our **kayak adventure** starts. After a brief introduction on how to use kayaks, we jump on board to discover the wild nature of the fjord. * We paddle for one hour along the coast, admiring the spectacular surroundings, as far as **Bleiklindi**, a small harbour named after a rare sample of wild lime tree which grew directly above the jetty. It is a very peculiar plant as, unlike all other plants, its leaves turn yellow in spring and green in autumn. * We then reach the small **Holmo peninsula**, where Viking burial grounds dating back to the late Iron Age have been found. * We disembark here and enjoy a **delicious picnic** in a fairy-tale setting. * After lunch, we return to our kayaks to head back and admire the **breathtaking views** from a different angle. * There is no tour rep: a local guide will provide general information in English. * You must be physically fit to take part in this excursion and not suffer from back pain. * We recommend wearing comfortable shoes, preferably with a rubber sole as they may get wet. * Minimum age: 12 years. * The excursion is suitable for everyone and no previous kayaking experience is necessary.